Skylum today announced the release of a significant new version of Luminar. The update 1.2.0 for Luminar 2018 includes lots of new features (they claim over 300 improvements) but there are a couple of fairly significant ones that I’m going to cover. The most notable of which is a dramatic improvement in the speed of opening and working with raw files. They’ve also added automatic lens correction (finally) and support for DCP colour profiles (not to be confused with Lut mapping). I was most impressed with the differences in opening Raw files. Previously it had taken my computer 20-30 seconds to fully open a RAW file, but now it does it in 3-4 seconds. This is not an insignificant improvement. According to the press release here are the main key features: (As I’m travelling at the moment, I’m just re-printing some information from the press release. I would normally re-write this properly, but I’m trying to do this on hotel wifi!) There’s no mention of the asset management side of the software that was previewed previously, so it’s not in this release. Speed improvements to get more done in less time Skylum has dramatically increased the speed of editing across all areas of Luminar. Now images open faster, filters apply quicker, and the entire application is more responsive. Better exposure calculation.Refined initial brightness setting for RAW files produces a perfect match to how a camera saw the scene. Cleaner gradients.Improved de-mosaic process for even cleaner image conversion, i.e. smooth transitions in areas like skies and shadows for accurate color and less noise. More cameras, better compatibility.Now even more RAW formats can be edited natively with the RAW Develop filter. Plus, a large set of existing camera modules have been refined for even better RAW conversion. Reduced chromatic aberration.If a lens shows color artifacts in high contrast or backlit areas, the new Auto Chromatic aberration removal option will help to get rid of green and cyan shifts. Automatic lens distortion removal Getting the perfect shot is now easier than ever. The RAW Develop filter analyzes an image and its metadata to calculate an Automatic Lens Distortion fix that can be applied in one-click. This is a perfect tool to get rid of wide angle distortion and get truer perspective lines and more attractive portraits. Advanced support for DCP Profiles Luminar recognizes the industry standard DNG Camera Profile, or “DCP” files, that users may already have on their computers (or have purchased from third parties) to ensure accurate and consistent colors. Users will also be able to use DCP profiles from DNG files. This feature is currently available for Mac and will be available soon for Windows. Essential New Features for Windows Users The Skylum team has put a lot of effort into making the Windows experience be world-class and significantly faster. In fact, the PC version now matches the Mac version for all core features with Batch Processing, Free Transform and Flip and Rotate tools. NEW: BATCH PROCESSING.The powerful Batch Processing workflow saves time and effort. NEW: EASY TRANSFORMATIONS.To easily transform the shape of an image, the Free Transform tool can scale and position an object as needed. Plus users can easily Flip and Rotate an image using the Image menu commands. Better cloning.Users can quickly call up the Clone & Stamp module by pressing Ctrl + J. Softness, opacity, and size of the brush can also now be modified. Cleaner zooms.Accelerated zooming now delivers a cleaner image at all sizes. Images appear sharper when the zoom is beyond 100% for detail work. Plus the new version provides a cleaner preview when zoomed out to see the whole image. Better masking controls.Users can create masks more easily when painting masks. Holding down the spacebar and dragging with the cursor, pans and moves the image when masking. 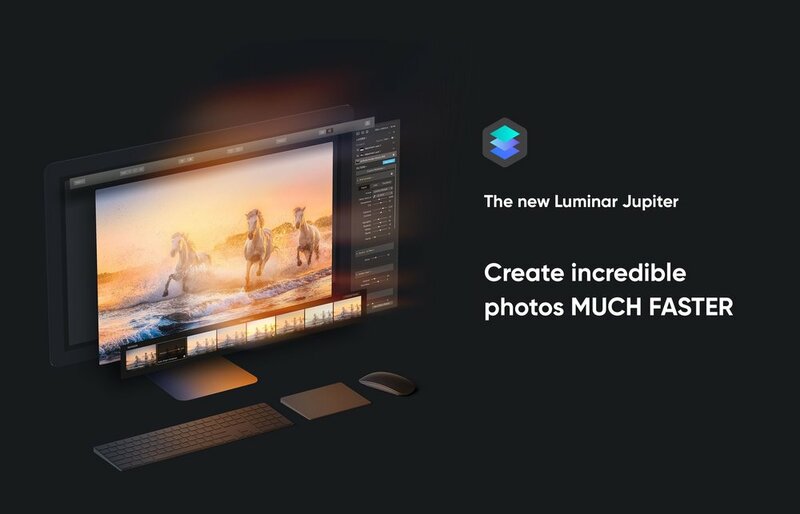 Luminar 2018: the most powerful and technologically advanced photo editor for Mac & Windows (worth $69) - Luminar 2018 is a fast, versatile, and intuitive image editor, which can take your workflow from RAW file to fully finished image without needing to use any other image editor. The Complete Landscape Photography Guide ebook from Photzy (worth $50) - An outstanding guide written by professional photographer and writer Kent DuFault. This ebook has something for everyone, with 237 pages packed full of information and assignments that will transform your landscape photography. Aerial Photography & Video with Matt Granger (worth $79) - World-renowned photographer, Matt Granger will share planning, shooting and editing aerial stills and video. Matt will also demonstrate editing with Luminar 2018 on his still aerial images.. Photography Tutorial by Daniel Kordan (worth $29) - Extensive tutorial with a full workflow demonstration by expert landscape photographer Daniel Kordan. This tutorial includes shooting and post-processing images in Luminar 2018. 119 Dramatic & Romantic Sky overlays (worth $29) - This is an amazing addition to your photo editing workflow, and will help give boring skies that “wow!” factor. Splitsville Presets By Brian Matiash (worth $15) - Add a professional polish to your images with these cool presets. For more information visit the Skylum website.